The new Range Rover Evoque passed an important milestone today when the first production vehicle was driven off the line at Land Rover’s Halewood manufacturing plant in Liverpool. Jaguar Land Rover's CEO, Ralf Speth together with JLR executive officers, union representatives and employees, gathered to celebrate the start of new Range Rover Evoque production. The first car to come off the line will be donated to the British Motor Industry Heritage trust. "The Evoque is an incredibly exciting vehicle that joins a product range which across both of our brands is the strongest we have ever had – and it fits in perfectly." 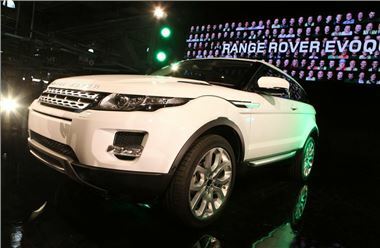 commented Dr Ralf Speth, Jaguar Land Rover Chief Executive Officer." The teams that have designed engineered and built the new Evoque, working together with our research and supplier partners, can be immensely proud of their achievement. Worldwide interest in our new car has been exceptional, with 18,000 customer orders received from customers eager to be among the first to own the new Range Rover. Halewood Operations is central to the success of the Evoque, with the workforce doubling to more than 3,000 employees in order to deliver the new model. Seventy-five per cent of production is destined for export to more than 170 countries around the world, adding around £2 billion to the UK economy. Moreover, 50 per cent of the components in new Evoque are made in Britain, with contracts worth another £2 billion awarded to more than 40 UK supplier businesses. The launch of the Range Rover Evoque is just one of 40 new product actions that Jaguar Land Rover will carry out in the next five years in the most ambitious market offensive in the history of its two brands. This product creation programme is supported by annual investment of £1.5 billion in developing new models, engines, technologies and vehicle lines. Currently Jaguar Land Rover directly employs almost 19,000 people in the UK, and indirectly supports up to 140,000 further jobs through its supply chain, dealer network and associated business operations.